This particular unit is one such ripoff. When I bought it … I thought it said SongDocky … so that's what I call it. It's one that I have and it works very well. I got this particular unit from Rapdbuyr when they had a $10 off any purchase deal - making the price $4.99 shipped. I figured it would come in handy once I made the transition to a lightning connector since I have a pretty big investment in docks that have the 30 pin connector. Unfortunately, the dock only transmits stereo audio - so you can't control any other aspects of the dock itself. You also can't control the iPod, iPad, or iPhone in your hand (or wherever it is) with the dock's remote as would be able to do if the iDevice itself were physically docked. 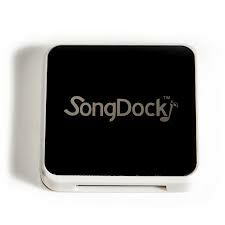 This also means that you cannot transmit video through the SongDock. 1) Plug the "SongDock" into a 30 pin iPod/iPhone/iPad dock connector. 7) You now can hear ANY audio that would normally flow through the dock connector. I have several other such devices and the Belkin bluetooth adapter has the same pairing instructions and code. The process should work fairly similarly with computers (Both Mac and PC) and other smartphones.